Discover Arlynn’s secret weapon to stop his screeching Fraidy cat Max. with the especially long earflaps? I am reading a Children book after a long time. I want to read something to my 5-year kid and so,gladly accepted a review copy from the author. The story is about a boy named Arlynn and his cat Max. Max starts screeching badly whenever it sees Arlynn's birthday gift which is a red cap with long ear flaps. Even though Max is a lovely cat, Arlynn gets afraid whenever it screeches like hell and he loves his new red cap too, so couldn't sacrifice it for the cat. 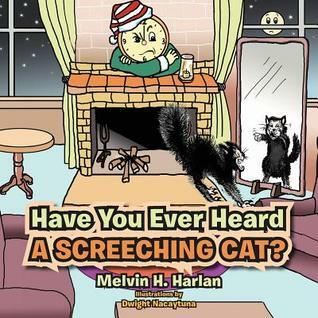 What he does to stop his Cat screech is the remaining story. The narration is good and easy to follow, but a few words are difficult to catch for young kids. I felt it is not appropriate for my 5-year-old because of some difficult words that I had to explain. This book might be good for kids above this age. The book cover and illustrations are great. The title is very apt. The plot overall and narration are interesting and made my Son sit and listen to it. I loved the message at the end. PS: I have received this book from the author in exchange of an honest review and this is my unbiased opinion. Nice to know about this children's book.